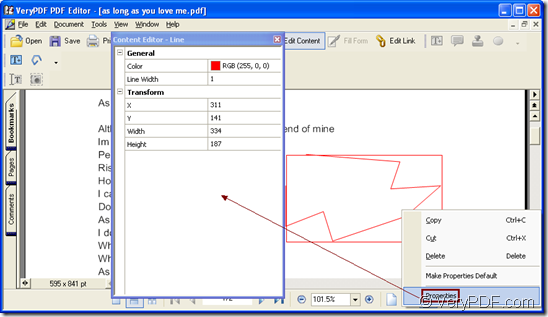 When you want to add the polyline content in PDF document, you can use the powerful application—PDF Editor to help you. PDF Editor is a good application which can be used to edit PDF document, convert many kinds of files to PDF document, read PDF document. So adding some different kinds of content into PDF document is not a difficult task. For using PDF Editor, you need to download the application at the following link: www.verypdf.com/pdf-editor/pdfeditor_setup.exe. The installation is necessary for your further using. If you want to use PDF Editor usually, you’d better create a desktop for the application so that you can conveniently find and use it. When you want to open PDF document in PDF Editor, you can take the following way: Please find the PDF document and right click it. In the popup floating item you need to click “Open With”—“Choose Program” to open “Open With” dialog box in which you need to click “Browse” button to find select PDF Editor as your tool in the popup dialog box. Then you need to activate the content status via clicking “Edit Content” button in the toolbar or click “Tools”—“Edit Content”. Please click “Tools”—“Content”— “Draw”—“Polyline” or click “Add Polyline” button in content toolbar. You can add the polyline content now. Move the cursor to the place you want to draw the line. Left-click the mouse and drag it to anyplace you like, and then there appears a line along with the cursor path. Pause your finger and change the moving direction to create an open shape with multiple segments. Double-click the cursor or click “Esc” key on the keyboard to exit drawing, or else the cursor always drags the line to anyplace it moves. Please see the polyline content in Figure 1. When you click the polyline, a red rectangle will frame the polyline, which means you can edit it. 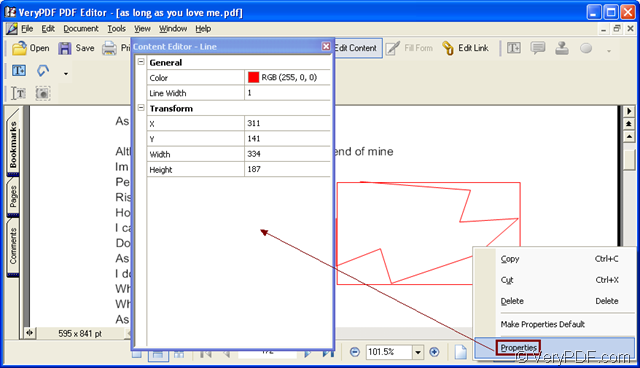 Please right click the polyline and you can choose to copy, cut, delete the polyline in the floating item. You can also click “Properties” option for opening “Content Editor-Line” dialog box to set the line color, width or the coordinate of the start point for the polyline. When you finish edit the polyline content, please close the dialog box and click “Save” button in toolbar of PDF Editor interface or click “File”—“Save” to save the changes you have made. At last, please click “File”—“Save as” to open “Save as” dialog box for creating a new PDF document with the polyline content you have added. In “Save as” dialog box, you can input the name of the new document and set the output location for the document. Then all the operations have been done. If you want to use PDF Editor without any limitations, please buy the application at its homepage: http://www.verypdf.com/app/pdf-editor/index.html where you can also get some detailed information about PDF Editor. How to edit PDF content? Hello, I am an editor, and sometimes I need to stamp the "APPROVED" word on some PDF files, how can I do it?